We are about to make the change that we are in doubt will suit all users. stripe yellow color will be shown? Um.. why don't you just break it out into two categories, one for error severity and one for warning severity by default? You already have "JavaDoc errors" and "Unknown javadoc tags" so just breakup "JavaDoc errors" to "Javadoc warnings" and "Javadoc unresolved references." severity and one for warning severity by default? colors available for warnings in the editor? symbols, unused symbols, unmatched braces, bad characters, and so on. the level to "warning" or "error". specific kinds of errors, just like I can for unknown symbols and so on. special markup for constructs that indicate performance problems. Any comments or thoughts about this? Have I missed something obvious? I really think we need another inspection level, e.g. "info". Many inspections could by default be moved to "info" level. "unresolved references" as yellow warning only. I wouldn't do that. If it is red in the editor, then it should have a red error stripe. You could add this as an optional decorations like "error - editor, warning - stripe", but I wouldn't make it the default because it is confusing. Perhaps something can be changed there too? and erroor stripe to be yellow. This reminded me that I had customized my Error Stripe Mark for Unused symbol to be a grey line and Deprecated symbol to be a black line to match the decoration in the editor pane. Before I had done this, there were a number of times when I would see yellow stripes in the gutter for the code visbile in the editor pane, and I would search around looking for what was highlighted in yellow. In took me a few seconds to realize that it was the Unused Symbols which were greyed out. I would recommend Jetbrains do this for all of the errors and warnings. with a yellow underline too. >> Perhaps something can be changed there too? 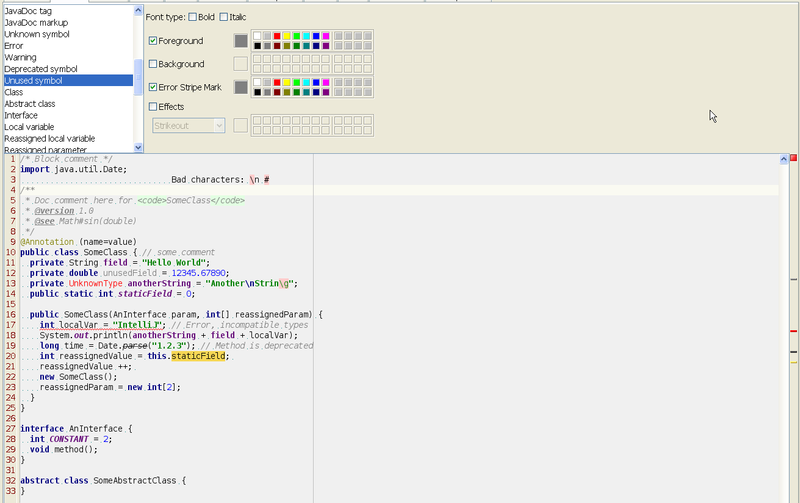 -1 from me for different colours in sidebar and the editor. yellow-highlighted in the editor and yellow in the sidebar. That would match perfectly the behaviour of other inspections. copied over to JIRA even though it has plenty of votes. Any chance of getting something like this in Demetra? probably not a very good idea', rather than something fatal. Sounds confusing to me! Personally I'd be happy with yellow markings in both the editor and in the error stripe. You need to have consistency between the editor and the error stripe, otherwise there's the potential for more of these wooly areas to creep in and the whole colour-coding scheme will become useless. As someone else mentioned, most of the time I only really look at red stripes and I'd prefer them to only point out compilation issues. I'd rather the gutter and the highlight were the same (or user-specified). I would prefer to see the red gutter stripe reserved for critical errors ('won't compile' or 'won't run'). Perhaps we need a greater variety of indicator categories (e.g. Critical Error, Error, Warning, Information, Hint, etc., perhaps make them user-selectable or user-definable), and more space to display them. I've been thinking that multiple gutters - or a filtered gutter - might be one way to go. Provide the option to show a certain subset of indicators, or perhaps allow two gutters side by side. Or you could have a runtime/debug gutter (breakpoints, bookmarks, execution point, etc), and an editing gutter (errors, warnings, bookmarks, hints, todo, etc). Clearly there is likely to be some overlap (e.g. bookmarks), but when there is too much information to display in a single gutter, some kind of task-specific display switching could be useful - Eclipse goes a little too far with this for my taste, but I think there is merit in the idea - if it can be made user friendly and customisable. I submitted a possible solution into Jira back in May. It never went anywhere. done. It's just too easy to lose track of a bookmark/todo/highlighted item.